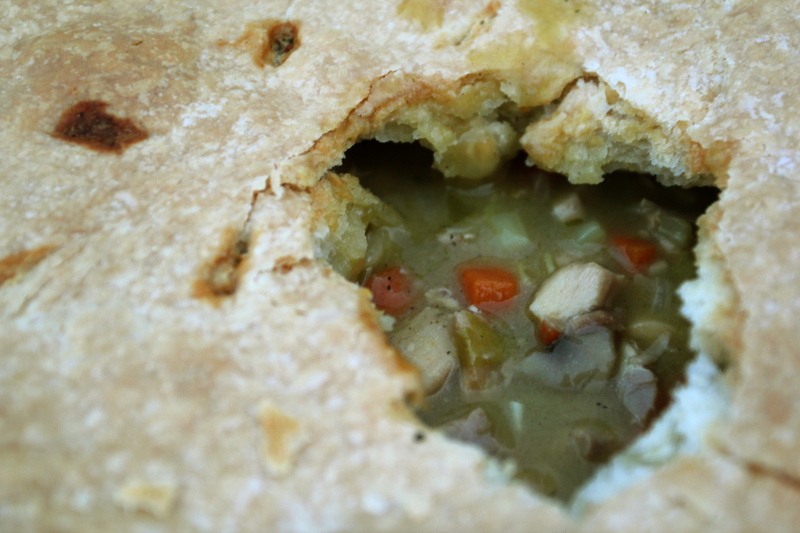 When I was a kid I LOVED pot pies. Most of the ones we ate were from the frozen section in the grocery store, and my parents only subjected us to them because they were stuck late at the office or didn’t have time to cook after taking us to soccer practice. But I always thought they were an unexpected treat. Now that I am all grown up, and can not bare to eat the frozen variety (for oh so many reasons) I have come up with my own version, made from scratch! Enjoy. For the pastry, mix the flour, salt, and baking powder in a bowl. Add the butter and use a pastry cutter to mix/cut in the butter until it is the size of peas. Add the ice water slowly while mixing with you other hand; process only enough to moisten the dough and have it just come together. Dump the dough out onto a floured board and knead quickly into a ball. Wrap the dough in plastic and allow it to rest in the refrigerator for 30 minutes. In a small saucepan, heat the vegetable/chicken stock. In a large pot or Dutch oven, melt the butter and saute the onions, mushrooms, and celery over medium-low heat for 10 minutes. Add the rosemary and sage and cook an additional 3-5 minutes. Add the flour and cook over low heat, stirring constantly, for 2 minutes. Add the hot vegetable/chicken stock to the sauce. Simmer over low heat for 1 more minute, stirring, until thick. Add 2 teaspoons salt, 1/2 teaspoon pepper, and heavy cream. Add the cubed chicken (potatoes), carrots, and parsley. Mix well. Roll out the dough. Take a round casserole dish or dutch oven and flip it upside down on the rolled out dough. Trim the edges of the dough to 1-2 inches from the edge of the casserole. Flip the dish back over and fill with the vegetable/chicken mixture. Place the dough on top of the dish, folding over the sides. Cut a few slits in the center of the dough as a vent. 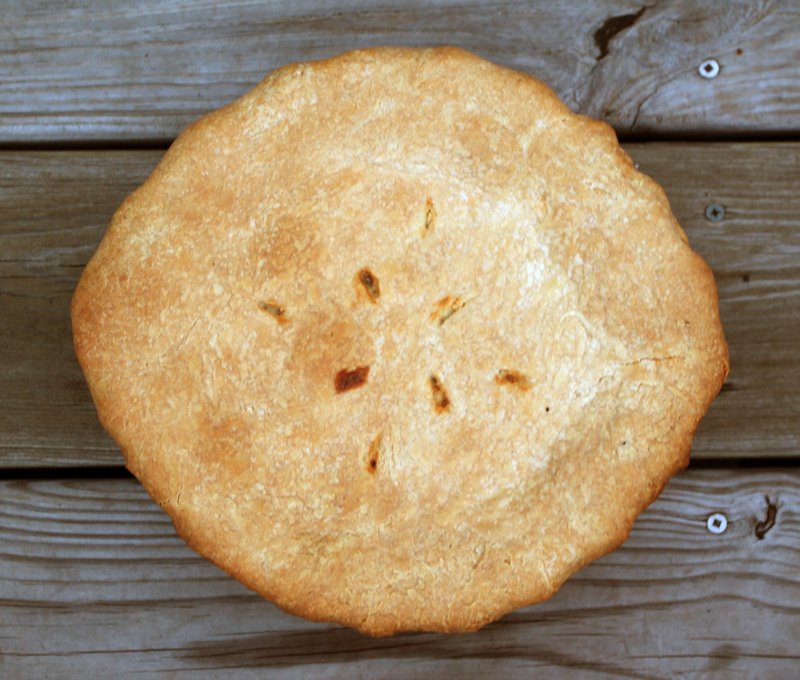 Bake for one hour or until the crust starts to brown at the edges. Thanks Andrea! let me know how it turns out!